Zone Zone 6 , 7 and 8. A shy and dominant tigress of zone no. 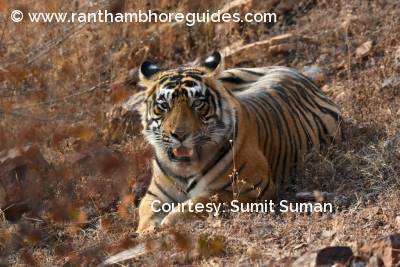 6, 7, and 8, she roams between Balas, Chidi-Khoh and Kundal area. 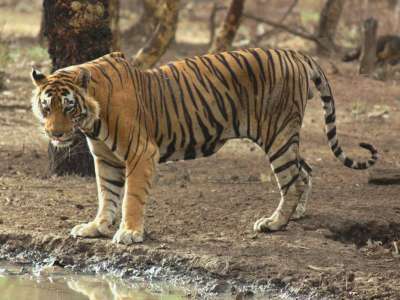 She is one among the three cubs born to T-5 Kachida, tigress and fathered by T-2. . She was the smallest of her three siblings and shiest. 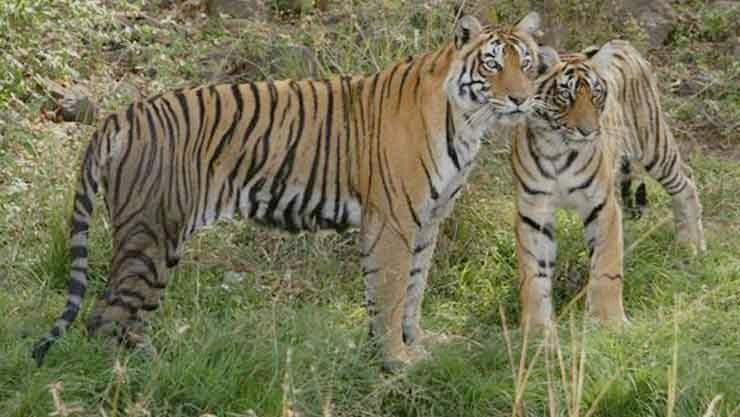 Her mother’s favorite and hence her name was given, (beloved- Ladali).Her siblings - T-6 (Romeo) is resident male of Chiroli area where as T-7 shifted in Sariska on February 23, 2011, locally known as ST-6. She had given her first litter including one male & one female in 2011. After grew up as adults, they had separated from their mother (T-8) in 2013 While a female cub is known as T-61 settled down in zone no. 8 (Balas area) of the park that was also part of her mother’s territory, A male cub became T-62 who had to move out of the park in 2013. Again, she was spotted with her second litter of one cub around November 2013 in Balas area but little is known about this litter. 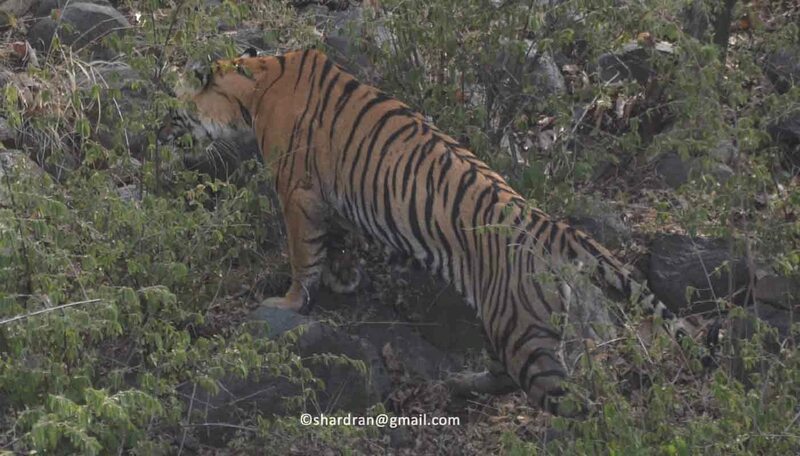 She had given her third litter including two male cubs, spotted with 3 month old cubs for first time on 4th June 2014 at Chhidi-Kho area (zone no. 7). She shares her territory with a dominate tiger, T-34 known as Kumbha. He is probably fathered her all three litters. Unfortunately, in one accident, one male cub of third litter of T-8 found dead March 9, 2015. 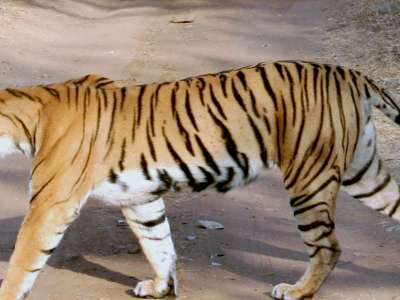 It is assumed that the male cub was killed by T-58. Now days, she is with her one male cub. 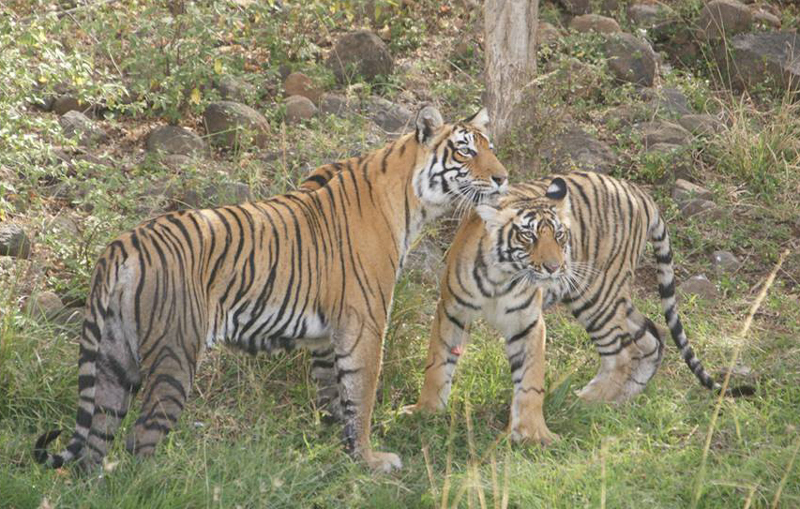 The both males cubs got their tiger code as T-86 and T-87. T-86 was dead on March9, 2015 while T-87 is trying to make its own territory and usually sights in zone no.3, 4 and 6. After separating her own cubs, Ladali gave her 4th litter including 3 cubs. She was sighted with her 4th litter including 3 cubs in the morning safari on Feb.28, 2017. God bless HER! Met yesterday, March 10, 2018, in zone 6. We had plenty of time to osserverà her together with her two cubes. They reached separately the wather and, after drinking, they were together on the grass. It was so awesome to watch three tigers together! Amazing! Thanks to your perfect organisation we could enjoy the wildness of you Park. Thanks. We saw Ladali today (3rd March 2018 )in Zone 6. After a drink in the nala, she was roaring for her cubs. We spotted her cubs later, sitting atop the fort gate near the entrance, about 3 kms away. You are really very kind-hearted to me, Sir, Denis Rouffanche because I used your picture without asking and without your copy right. After that you are glad. such a big heart ... I really respect you very much ..Thank you very much for your great cooperation... ..